STATEIMPACT PENNSYLVANIA — A judge has rejected a petition by seven residents of Delaware and Chester Counties for an emergency shutdown of the Mariner East pipelines. Elizabeth Barnes, a Public Utility Commission administrative law judge, said the residents failed to show that there was a clear and present danger to the public from the construction and operation of the pipelines; that they were entitled to immediate relief; that injury to them would be irreparable if not granted; and that the shutdown they sought would not harm the public. “Petitioners/Complainants have failed to demonstrate by a preponderance of the evidence that they have met all four requirements and are entitled to emergency interim relief,” Barnes wrote in a 16-page opinion. The petition was the latest attempt by opponents of the multibillion-dollar Mariner East 2 to halt it before it goes into service, as scheduled, by the end of 2018. The Mariner East project is made up of three parallel natural gas liquids lines — the Mariner East 1, the Mariner East 2, and the Mariner East 2X. Mariner East 1 is already carrying natural gas liquids. The plaintiffs had asked for the emergency shutdown while Barnes reviews their request to permanently shut down the lines. The residents’ formal complaint at the PUC alleges public safety is endangered by the pipeline. She also dismissed their arguments that the public was endangered by valve sites where horizontal pipes entered or left the ground, or where the Mariner East pipelines are co-located. Although one valve site is about 100 feet from a restaurant, that doesn’t represent an imminent threat to public safety, she wrote. In rejecting the petitioners’ arguments that they would be irreparably injured if relief is not granted, Barnes said they had conceded that the risk of fatalities is small, and so they failed to show that they would be harmed irreparably by fatalities, personal injuries or loss of property ahead of a full hearing on the complaint. And she sided with Sunoco on the issue of whether the public would be harmed if she granted the emergency petition. The company, supported by Range Resources, offered “credible evidence” that it would be financially hurt if the petition was granted, whereas the petitioners failed to provide enough evidence of the likelihood of a catastrophic event to meet the standard on public injury, the judge wrote. Activist groups, especially in Philadelphia’s densely populated western suburbs, say the pipelines will be a bigger risk to public safety than those carrying natural gas or oil because of the highly explosive nature of the natural gas liquids – ethane, butane and propane – that will be carried by the new lines. The pipeline is slated to run through Dauphin, Cumberland, Juniata, Lancaster, Lebanon, Perry, York and Berks counties. The complaint accused Sunoco, a unit of Energy Transfer, of failing to tell residents how to protect themselves if there’s a leak, and it mocked the company’s instructions not to use possible ignition sources such as cars and cell phones in the event of an escape of NGLs. The document asked how emergency officials would be able to inform thousands of people of a pipeline incident if they should not be using their phones. And it said the company’s instructions to walk upwind of a leak would not help immobile residents like the elderly or infirm. 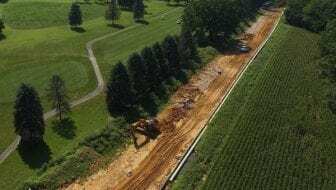 Residents’ fears were fueled when Sunoco said last summer it would repurpose a 1930s-era 12-inch pipeline with a history of leaks as a temporary section of Mariner East 2 in Delaware and Chester counties while the new pipeline is completed. Sunoco continues to say that it meets all state and federal safety requirements, and that the 12-inch line had a $30 million upgrade in 2016. In May, Barnes halted construction of the two new Mariner East pipelines, plus the operation of the existing Mariner 1, at West Whiteland Township in Chester County. In her response to an emergency petition by State Sen. Andy Dinniman (D-Chester), the judge said the pipelines posed an “imminent risk” to the public, and they should be shut down until the PUC confirmed their safety. Three weeks later, the full PUC partially overturned her ruling, allowing Mariner East 1 to resume operations, but upholding the ban on ME2 construction. That ban was lifted in August. Caroline Hughes, a plaintiff from West Chester, said after the ruling that she had expected the emergency petition to be a heavier lift than the formal complaint, which she said will give the petitioners more chance of success. She said the plaintiffs’ formal complaint will be helped by a recently published Delaware County Council study on the safety risk of ME2, which was not part of the emergency petition. The study said that a worst-case explosion of natural gas liquids from the pipe would kill anyone within a mile of a rupture but that the chances of dying in a pipeline incident are less than from a car crash. But Michael Bomstein, an attorney for the petitioners, said there will now be discussion about how or whether to move ahead with the formal complaint, based on what the ruling suggests about the outcome of the full case. On an initial reading, Bomstein said the judge’s reasoning seems to be based on the idea that petitioners can’t show an emergency unless they also show the risk of an event occurring, an approach that the petitioners deliberately avoided. Bomstein said the judge may have been influenced by the full PUC’s decision in June to partly overturn her ruling a few weeks before that halted pipeline construction and briefly shut down operation of Mariner East 1 in West Whiteland Township, Chester County. The Pennsylvania Energy Infrastructure Alliance, which advocates for Mariner East and other pipelines, said the ruling is the latest evidence that the project is safe. Sunoco spokeswoman Lisa Dillinger welcomed the ruling and said the pipeline — which has been frequently delayed by legal, technical and environmental problems – is still on schedule to meet its latest startup target of the year’s end. “We are in the final stages of completing the construction required to put the line in service, which we anticipate will be by the end of the year,” Dillinger said.